Will the Santa Teresa streetcar ever come back? For the last 15 months, the streets have been full of digging, traffic jams, dust and mud. Over the period, only 20% of the streetcar infrastructure has been replaced. Buses – a “temporary” solution — don’t meet residents’ needs. The initial promise was that the trolley would be back in time for the 2014 World Cup. In other words, no one knows the answer to this question. This past April 22, a meeting of residents and the newly-installed State Transportation Secretary, Carlos Osório, provided the reassuring news that, despite delays and unexpected costs, and the deplorable state finance situation, there are still funds for the streetcar. “So far, 30% of the budget has been spent,” said Osório. Funds for the replacement of tracks, overhead cables and an electric substation total R$ 58,6 million, or US$ 19.4 million at today’s exchange rate. For 14 new streetcars, the budget is R$ 52 million, or US$ 17.2 million. Altogether, this is a minimal amount, compared with the ongoing extension of the Rio Metrô’s Line 4, currently the biggest urban infrastructure project in Latin America, with a budget of R$ 8,7 billion, or US$ 2.9 billion at today’s exchange rate. 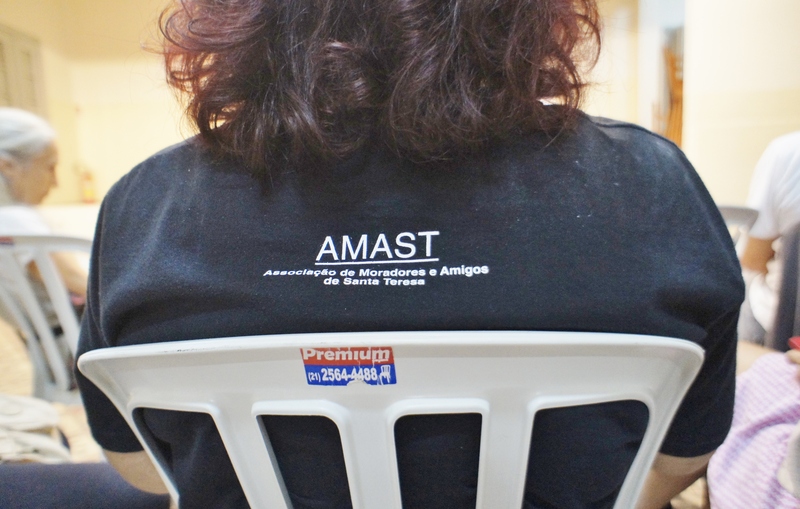 According to Jacques Schwarzstein, president of AMAST, the Santa Teresa friends and neighborhood association, delays on the streetcar work were caused by unplanned-for issues such as retaining walls and the need to replace water, sewage and gas pipes that run beneath the tracks. The most recent problem are cobblestones that hinder the new streetcars’ requisite fourth brake, which is magnetic and thus must fully come into contact with the metal track. The trolley manufacturer is TTRANS, a company located in Três Rios, specializing in trains and subway cars. They previously built trolleys for Santa Teresa (nicknamed Frankensteins by residents), whose faulty design had not taken the neighborhood’s curving roads into account. The group undertaking the roadwork, Consórcio Azvi-Elmo, is currently busy sawing rebellious cobblestones. For these and other reasons, on April 22 several meeting participants wore signs stapled to their clothing, asking: “Where is the Executive Plan?” A detailed executive plan would have foreseen the unforeseen, including the fact that no map of underground pipes exists. There never was an Executive Plan, said the Secretary, accompanied at the meeting by Roberto Marques, president of Central, the state agency that runs the streetcar system. The Santa Teresa streetcars came to a lasting halt in August 2011, after a tragic accident caused by decades of insufficient investment in maintenance and parts. According to Schwarzstein, many residents didn’t want the streetcars or the tracks to be replaced. They believed it was possible to refurbish both. The state, however, insisted on a larger project, which ended up being managed by the Governor’s office — although this was the responsibility of Central (which has now taken it back). A documentary on the streetcar, made by resident Jorge Ferreira before the accident, tells the long story of employees’ creative and courageous improvisation that contributed directly to the survival of the Santa Teresa trolleys – in the face of the “modernization” taking place in the rest of the city, prioritizing tires over tracks. Today, it’s sad to see that the improvisation lives on, now on the part of the government. The pipe replacement by Cedae, the state water and sewage company, wasn’t foreseen in the Basic Design, or in the company’s work schedule or budget. Thus the work is being done, without a contract, by a day-to-day maintenance crew, taken off other work in the area served by the company. And every carioca, used to skirting puddles of sewage and wasted water, knows there’s an impressive pileup of such work. 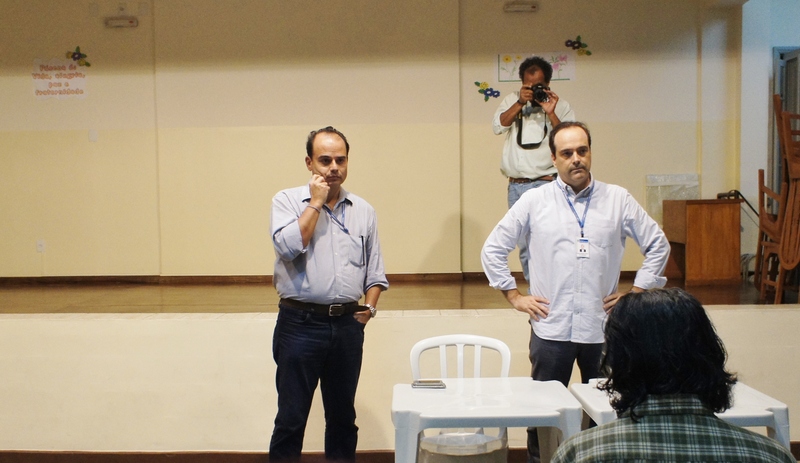 During the meeting on the 22nd, Secretary Osório asked residents if they want Cedae to go ahead with the pipe replacement, or if they prefer the company to wait for the continuation of the streetcar work, stalled while the state and the consortium negotiate the future. “Where’s the Executive Plan?” some residents asked, again. “How can we decide this? It’s a technical issue!” Others, impatient with the delays and the inconvenience caused by the digging, want Cedae to continue with its part, to at least get something done as fast as possible. The Secretary apologized for the management errors and accepted an offer to work from now on in partnership with the neighborhood, whose residents pool a great deal of knowledge that can be useful to those doing the work, even if it’s not highly technical. “Santa Teresa isn’t Disney World,” Osório said in recognition of residents’ wishes and feelings. That’s nice to hear, about a neighborhood whose hardware stores, bakeries and stationery stores have turned into bars and hostels in recent years (even without the streetcar). Rio de Janeiro’s mega-events era brought with it the concept of branding, along with the notion that cities compete with each other for events and tourists. An issue rarely debated now, however, is if branding, in situations with little real-life content and human exchange — the rich daily life of cities — can be enough to attract tourists. That’s what Tony Judt, above, was talking about, in regard to an English village. Of course Rio de Janeiro offers more than Barnsley. But this blogger fears that we’re still capable of letting the Marvelous City become a hollow remnant of what it once was. 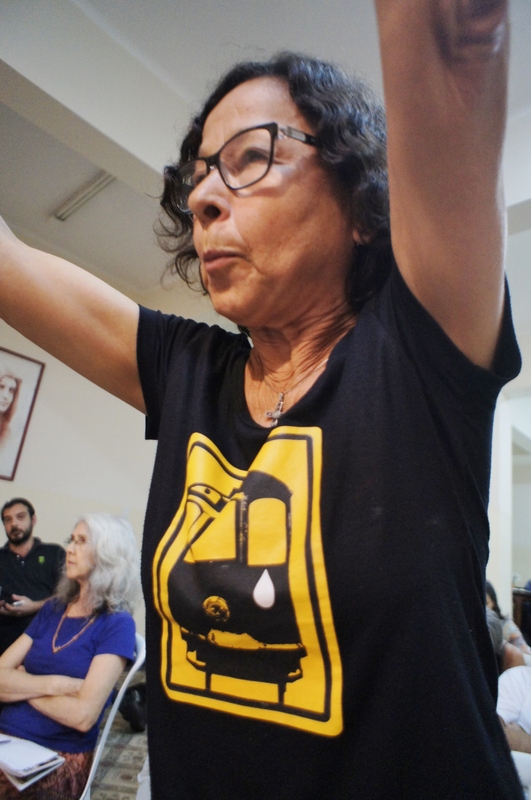 From what the Secretary said, there’ll be no Executive Plan for the streetcar, despite the fact that the lack of such plans all over Brazil have led to problematic public works. In recent decades, governments and construction companies created a modus operandi whereby contracts were signed on the basis of a Basic Project. As the building progressed, details are added – and costs (plus opportunities for padding the bill) balloon. 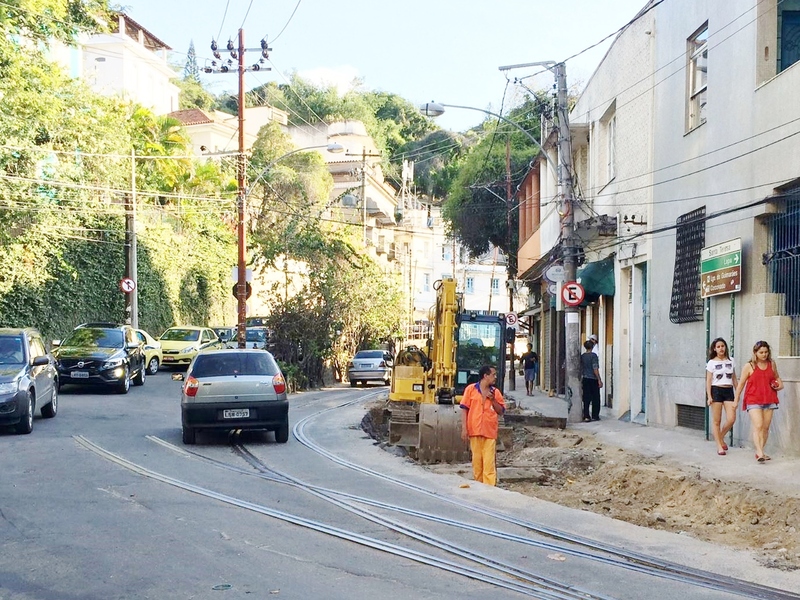 If some of Brazil’s large construction projects were under the kind of watchful eyes that the Santa Teresa streetcar has always had — of residents, employees and passengers — perhaps they could escape poor management and corruption. But, given the irony of the way things play out here, they might never see completion. With the lack of planning, coordination between different government agencies and suitable preparation of employees and workers, a watchful eye is not enough. And branding may not do the trick either. This entry was posted in Brazil, Transformation of Rio de Janeiro / Transformação do Rio de Janeiro and tagged AMAST, Carlos Osório, CEDAE, Central bonde, Consórcio Azvi-Elmo, Jacques Schwarzstein, Jorge Ferreira, Rio de Janeiro planning, Roberto Marques, Santa Teresa Bonde, Santa Teresa streetcar, Santa Teresa trolley, TTRANS. Bookmark the permalink. Nice to hear from you, Laura. Hope your friend never banged his head on the trolley! The Bonde is an irreplaceable part of Santa Theresa’s and of Rio’s historic infrastructure. Well done for making us aware of the bad management, Julia. Let’s hope residents keep up the pressure. Is it a possible election issue? It took more than 20 years to build a new bridge in San Francisco after the 89 quake. Just sayin.